Readers, hello! I’ve failed miserably in blogging my way through September, sorry about that! It’s been a busy month, with a couple of weddings, catching up with friends and spending the rest of my time doing some upcycling. 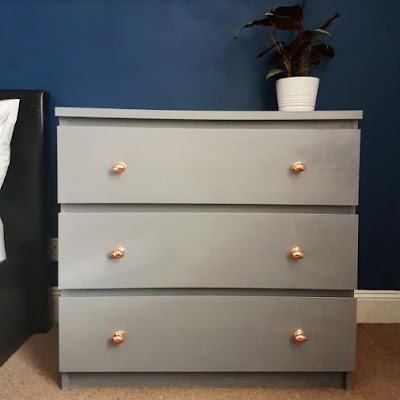 Door Furniture Direct, on an upcycling project and thanks to them, they really helped me finish my upcycle on this old chest of drawers. We bought the unit 5 years ago, when we bought our first place and as it’s always lived in the spare room, we never really gave it a second thought. The spare room has always been a bit unloved, but we’ve recently done a whole makeover – painting this chest of drawers, the wardrobe and doing the walls and soft furnishing, but that’s another post that’s coming soon. Today I’m chatting just about the Malm unit upcycling, which features these amazing rose copper knobs from Door Furniture Direct. I was allowed to pick anything I wanted, up to the value of £30, so managed to get 6 of these for my project. 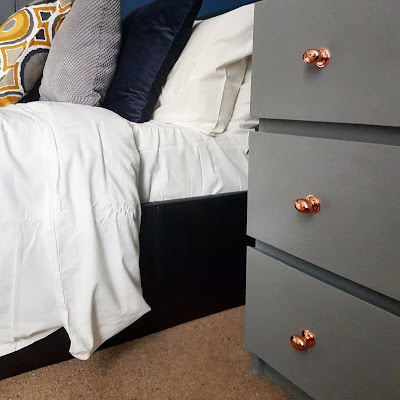 The unit was painted in Anthracite grey furniture paint by Rustoleum and then varnished with a matt varnish to protect it. 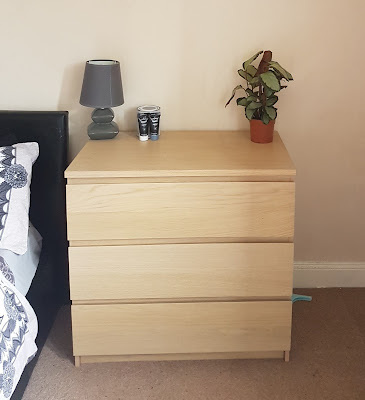 As most of you will know, the Malm units don’t have pre-drilled handle holes because of the top opening, so I had my first drilling experience (no jokes at the back please) trying to measure, find the right drill size and then drill 6 holes, in equal positioning, across the 3 drawers. The drawer knobs were really easy to fit and came with screws etc, so all I had to do was drill through, push the screw through from the back and then tighten the knob on the front of it. 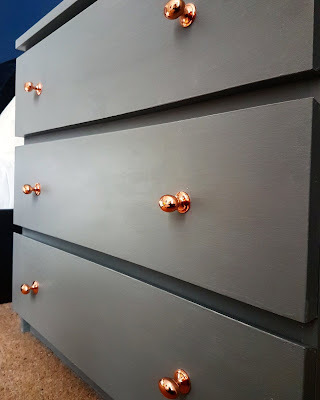 If you are considering your own upcycling project, if I can manage to drill and add drawer pulls, then anyone can do it. My painting tips from my bathroom upcycle still apply – use a shellac based primer (one coat) before you start, 2 coats of paint and at least 2 coats of varnish to make sure it doesn’t chip or damage. 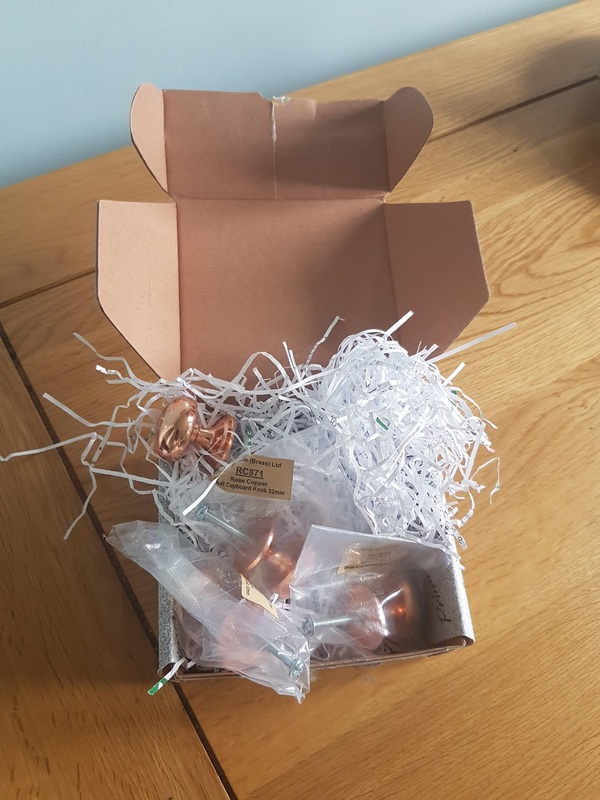 Disclaimer – I was gifted the rose copper oval cup knobs from Door Furniture Direct in exchange for a post on my blog. Any opinions expressed are my own.